80. The Chinese (according: to tradition) had already obtained from India a knowledge of gunpowder. 215. Julius Africanus (according to Meyer) described its preparation. 663. Callinicus of Heliopolis introduced Greek fire to the Byzantines. This was probably a mixture like gunpowder, with resin and petroleum; it was certainly no fluid, and according to one author was used to project stone balls from pipes. It may nevertheless have been a rocket mixture or a bomb filling. 690. The Arabs used firearms against Mecca, bringing the knowledge of them from India. 811. The emperor Leo employed firearms. 846. Marcus Gracchus, a Greek author (MS. said to be at Oxford), described a mixture of 1 lb. of sulphur, 2 lbs. of charcoal, and 6 lbs. of saltpetre. 850. Leo the Philosopher made rockets for the army of the eastern empire. 1073. King Solomon of Hungary bombarded Belgrade with cannon. 1035. In a naval battle near Toledo, the ships of Tunis shot "flery thunder." 1003. The Greek ships used artillery against the Pisans. 1232. The Tartars employed '"fire pipes" against the Chinese. 1233. Don Jaime threw into Valencia fiery balls which burst. 1247. Seville was bombarded with artillery. 1240. Damietta was defended against St. Louis with bombs, which on this and other occasions were much dreaded by the crusaders. 12S0. Death at Cologne of Albertus Magnus, a preaching monk, said by some ancient writers to have invented "bombardam, bombardulam et scolpum ma-nualem." 1294. Death of Roger Bacon, in whose works the destructive qualities of saltpetre, and the production of terrible thunder and lightning from its compounds, are alluded to as well known. 1303. Reported date on an ancient cannon, now in the arsenal of Amberg, Bavaria. 1303. The Spaniards had artillery before Gibraltar. 1311. Henry VII. bombarded Brescia with "thunder guns." 1312. The Arabs had cannon before Baza. 1826. Martos was attacked with artillery. 1830. Berthold Schwarz is said to have discovered gunpowder. Different authors say 1320. 1354, and 1380. MSS. in the monasteries perhaps informed him. From this time on, the allusions to the use of gunpowder become far more numerous and authentic. Plainly, its military use was revived in Germany, and carried thence to Italy. There is record of a powder mill at Augsburg in 1340; and in 1344 (or 1357, or 1366) Petrarch described the terrible effects of the newly invented but already widely used powder and cannon. They are said to have been employed at Alicante in 1331, at Pui Guillaume in 1338, at Salado in 1340, at Alireciras in 1342, and at Crecy in 1346. In 1378 the English had 400 cannon before St. Malo. In 1397 mines were exploded with powder before Merat; and the same tactics were employed on a larger scale at Belgrade in 1441, at Milan in 1523 (with poor success), and by the Turks in 1529 at Vienna, and in 1565 at Malta. England imported gunpowder from Sweden and elsewhere until 1560, when its domestic manufacture began. - The employment of gunpowder for blasting rocks is far more recent than its military use. The following dates and memoranda will convey an epitome of its history in this respect: In 1613 Martin Weigel, chief superintendent at Freiberg, proposed boring and blasting in the mines. Traditions of an earlier use in Germany have probably arisen from confounding the ancient method of building fires in the mines, to crack the hard rocks, with that of blasting. It was about 14 years before the new method was successfully introduced in Germany. Reckoning from 1613, the process was carried to England by German miners after 57 years, to Sweden after 111 years. For 72 years the bore holes were closed with solid plugs, instead of clay tamping; for 83 years the practicability and advantage of small holes were unknown; and for more than a century the operation of blasting was considered as merely auxiliary to the work of the pick, gad, hammer, and chisel. (See Blasting.) - The manufacture of gunpowder has been greatly improved from time to time in mechanical details, affecting both the safety of the process and the quality of the product. The first step is the preparation of the ingredients. The original impurities in a solution obtained by leaching saltpetre earth are nitrates of soda, lime, and magnesia; chlorides of potassium, sodium, calcium, and magnesium; sulphate of lime, various salts of ammonia, and organic substances (humus) partly held in solution by carbonate of ammonia. It will be seen that the solubility of chloride of sodium does not greatly increase with temperature. If desirable, the chloride of potassium can bo altogether transformed into chloride of sodium by the addition of nitrate of soda, which by a double decomposition yields both chloride of sodium and additional saltpetre. A crude material, containing say 4,800 lbs. of saltpetre, 360 lbs. of chloride of potassium, and 840 lbs. of chloride of sodium, would be refined by simple recrystallization, somewhat as follows: Half the mass would be dissolved in 1,200 lbs. of water, and heated to 100° C, while the remainder was added. This would dissolve also all the chloride of potassium, but leave a large part (516 lbs.) of the chloride of sodium. From the solution the organic impurities are removed by adding a little glue, boiling, and skimming, after which the temperature is allowed to fall to 18° C, at which point about 4,452 lbs. of saltpetre will be precipitated, 6 lbs. of chloride of sodium, and no chloride of potassium. A further re-crystallization will reduce still more the amount of impurity. This is the outline of the process adopted. It is modified by operations intended to hinder the formation of large crystals of saltpetre, which always contain enclosed portions of the mother liquor. The final product should never contain more than 3/100 of 1 per cent. of chlorides. In fine sporting powders the proportion of chlorides is usually not more than 1/100, or sometimes 2/1000, of 1 per cent. After a thorough drying by heat, the saltpetre is ground to the finest possible state, either with millstones or in mills specially constructed. - Charcoal is the principal form of carbon capable of giving an explosive gunpowder. Graphite or anthracite, when substituted, yields a compound which burns with some vigor, but not explosively. The causes of this peculiarity are not known with certainty. The wood selected for the charcoal is usually the young shoots of alder and willow. The bark being removed, they are placed in iron retorts and subjected to distillation, expelling the greater part, sometimes nearly the whole, of the hydrocarbons. Three grades of charcoal are recognized: red charcoal, containing about 8 or 9 per cent. of hydrocarbons, and having a strong red tinge; brown charcoal, containing 4 to 5 per cent. of hydrocarbons; and black charcoal, containing about 1 to 2 per cent. The red charcoal makes the strongest powder, and is generally used for the sporting variety; the black, and sometimes the brown, is preferred for heavy ordnance. The sulphur selected is refined brimstone; flowers of sulphur is objectionable because it contains sulphuric acid. The mixture is commenced by pulverizing the charcoal and sulphur together. They are rolled in barrels with small iron balls for about six hours, and are ultimately reduced to extreme minuteness. The saltpetre is then added, and another rolling with zinc or copper balls is given. The mixture is then carried to the mill, where it is moistened with water, and placed in a large circular pan or trough, in which iron wheels, weighing several tons and having broad treads, are rolled by machinery, triturating and kneading the powder into the most intimate mechanical union. The milling is the dangerous part of the process, and a year seldom passes at a powder manufactory without one or more explosions at the wheel mills, though the precautions are such that these accidents are seldom disastrous. The powder withdrawn from the wheel trough is very lumpy and irregular; it is therefore reduced by a breaker to a fine meal, in which condition it is transferred to a very powerful press. The meal is stacked into the form of a cheese, 2 or 2 1/2 ft. square and 3 or 4 ft. high, consisting of layers of powder 1 to 2 in. thick, separated by plates of copper or vulcanite. The press reduces the bulk of the powder nearly one half, and delivers it in sheets five eighths of an inch to an inch thick, winch, in hardness, lustre, and fracture, resemble thick slates. The degree of pressure to be given is one of the most important considerations in the process of manufacture; since the ultimate density of the powder is determined by it, and this in turn determines the rate of combustion. By merely varying the degree of pressure, the powder may be made either violently and destructively explosive, or mild and easy in its action. The press cakes are broken into grains by passing them through corning rolls, and the different sizes of grains are separated by passing the whole over a succession of sieves, with varying mesh. The grains thus obtained are sharply angular, and require rounding and smoothing to prevent their thin edges from being ground into dust by the wear of transportation and handling. While still moist, the powder (now granulated) is put into rolling-barrels, slowly revolved from 6 to 24 hours, and then withdrawn smooth, lustrous, and free from angularity. Sometimes the glazing is heightened by the addition of a minute quantity of graphite. A single table-spoonful of this substance will impart its peculiar lustre to half a ton of fine powder. Its presence has no appreciable effect upon the action of the powder, nor upon its preservation. The last operation, drying, takes place in a room heated by steam to 130° or 140° F. - Much progress has been made in the past 20 years in diminishing the destructive effects of gunpowder upon large cannon. A brief consideration of the relations between the pressure of a body of gas and the volume it occupies will readily indicate that the elastic force of gases generated by the combustion of gunpowder in a gun must be many times greater at the breech than at the muzzle; that is, greater in the earlier than in the latter stages of discharge. It is the maximum pressure which involves danger to the gun; and the principle upon which this progress has been based consists in keeping the maximum pressure well within the limit of safety, and increasing as far as possible all pressures below that limit. To accomplish this, advantage has been taken of the following properties: The combustion of a cartridge is not instantaneous, but progressive. It must first be ignited throughout, by flame from the vent, which diffuses itself through the interstices between grains, enveloping progressively the whole. Secondly, each grain must burn progressively from its surface to its centre. It is obvious that the pressure due to any particular position of the shot will depend upon the total amount of gas developed; and hence, if we can retard the combustion in the initial and accelerate it in the terminal stages, we can, in part at least, accomplish the desired end. At all events, we can reduce the initial gas development in two ways : first, by diminishing the amount of surface presented for ignition by a given weight of powder, which is done simply by increasing the size of the grain; secondly, by decreasing the rate at which combustion progresses into each grain, which is done by increasing the density of the grains, and thus closing more tightly the pores through which ignition penetrates their mass. The effect of diminishing the initial pressure without a compensating increase of the terminal pressures would be a reduction of the velocity of the shot. This may be restored by an increase of the charge, which augments again the initial pressure, but not to such an extent as to carry it beyond the limit of safety. By increasing the size and density of the grains while increasing the charge, artillerists have retained control of the energy of gunpowder, and at the same time have actually increased the velocities of even the largest projectiles. For instance, in 1864 the American 15-inch gun, when using 50 lbs. of powder and a shot of 450 lbs., showed a pressure of about 15,000 lbs. and an initial velocity of 1,100 ft. per second. At present (1874) the same gun and shot, with 120 lbs. of powder, give about 22,-000 lbs. pressure and 1,730 ft. initial velocity. Another improvement consists in giving to the grains definite geometrical forms. The advantage of this modification results not so much from the form itself, as from the fact that the action of the individual grains is much more likely to be uniform. In the process of pressing the powder, by the methods which have been in use for many years, great irregularities of density always occur; and as the explosive property is more influenced by the density than by any other quality, the advantage of securing uniformity in this respect is manifest. Geometrical or "pellet" powder requires a mould for each grain, whereby the density can be regulated with far more precision than by the old method. A leading variety of these geometrical forms is the prismatic, in which the grains are hexagonal prisms, about an inch in length and diameter. Each prism is perforated with seven holes, one tenth of an inch in diameter, parallel to the axis. They are symmetrically packed into a cartridge, of very small bulk in proportion to its weight. This form of powder is used for large rifled (Krupp) guns in the Russian, Prussian, and Austrian service, and its performance is excellent. Short cylinders have been used by the English, but they have been supplanted recently by pebble powder. Lenticular powder (grains in the form of lenses) has been tried in this country, but with indifferent results. 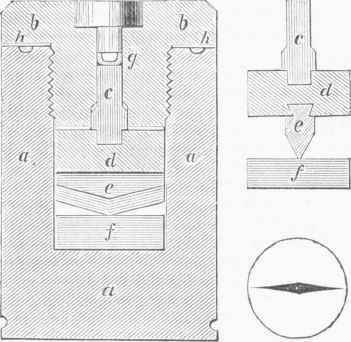 The central portions, as a necessary result of the mode of pressing, were much less dense than the peripheral, and therefore burned too rapidly. Grains which had been ignited in the gun and extinguished in the air, and collected afterward, showed that the middle portions only had been consumed, leaving a ring of the denser portions. Ritter prismatic powder is simply the prismatic form just described, but without the perforations; it has been used in Belgium only. Fig. 1. - Forms of Gunpowder. The density of granular powder is either the absolute density, which is that of the grains themselves, or the gravimetric density, which is that of a quantity of grains with their interstices. The absolute density ranges from 1.60 to 1.80, the most common figure being about 1.75. The gravimetric density is generally about equal to that of water. - Sporting powder is made with especial care, of the purest saltpetre and sulphur, and the most carefully selected charcoal. The article is usually judged by the velocity it gives to a projectile, and the amount of fouling. In both respects erroneous judgments are likely to be formed, since the mode of charging is more frequently the cause of a poor performance than any defect in the quality of the powder. If a given brand is found to give a lower velocity than desired, it is better to increase the charge than to resort to a more violent kind; for the smaller charge is more apt to strain and erode the gun than the larger charge of milder powder. There is seldom any sufficient reason for excessive fouling, since this may generally be corrected by the use of a patch and lubricant. - The force of gunpowder is measured by an instrument called a pressure gauge. Three forms have been used, two of which were invented by Gen. Rodman of the United States ordnance department. One of these is applied to the exterior of a gun, and communicates with the chamber by a narrow passage. The other is inserted in the cartridge bag at the base of the charge, and remains in the gun after the discharge. The internal gauge consists of a cylindrical box of steel, with a cover screwed on. Through the axis of the cover is a cylindrical hole, in which a steel rod is fitted. Within the box is a thick disk of steel, having a knife edge protruding from its lower face. This knife has a double shear, the edges of the two shears meeting at the centre in a very obtuse angle. At the bottom of the box the apex of the knife rests upon a disk of soft, annealed copper. The inner end of the steel rod is stepped into the steel knife disk, and its outer end is a little below the top of the cover. A copper cup rests upon the top of the rod, to serve as a gas check. The pressure of the explosion is received by the rod, which communicates it to the knife, the apex of which sinks into the copper, giving a cut, the length of which serves as the measure of the pressure. The working parts of the external gauge are quite similar to the foregoing, but the manner of housing them is different. Another form of gauge, invented by Capt. 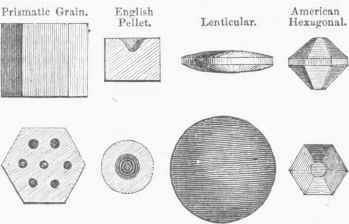 Noble of the English artillery, substitutes for the copper disk a short cylinder of copper, which is crushed by the pressure, the amount of crushing being employed to measure the pressure. This gauge is screwed into the wall of the gun in such a manner that the end of the rod receiving the pressure is very near the surface of the bore. Both forms of gauge are liable to grave objections, since the measure obtained is essentially dynamical, while the quantity to bo measured is statical. The English gauge is much inferior to the American, and cannot be relied upon to give even approximate indications of pressure when violent powder is used. - In the composition of blasting powder, nitrate of soda (Chili saltpetre) has of late years been chiefly used in the United States, instead of nitrate of potassa; the latter being subject to a high duty, while the former is duty-free. So far as explosive properties are concerned, the difference between the two is not very great; but the former absorbs moisture from the air and deliquesces, while the latter does not, unless the air be very damp and the exposure long continued. Hence nitrate of soda rapidly deteriorates, a matter of comparatively little importance in blasting powder, which is commonly used soon after manufacture. (For the constitution of other blasting powders, see Explosives.) But as war material is frequently accumulated and stored, or transported long distances and more or less exposed, military powder must be made with nitrate of potassa. Powder for blasting differs essentially from military or sporting powder in the formation of CO instead of C02, yielding the same volume of gaseous product for the same temperature, but less heat; hence a lower temperature of products, and consequently a lower immediate explosive energy. The combustion is also slower. The theory of its use has been to loosen the surrounding rocks to as great a distance as possible from the bore hole, and to waste as little force as possible in the hurling of fragments or the production of very small pieces, or dust. Usually a good deal of work with the pick and bar, and of subsequent breaking or blasting of large fragments, has accompanied the main blasting operations. The introduction of nitro-glycerine compounds has led to a change of practice; and many engineers now find a gain in the more complete shattering of the rocks by quick explosion, which permits an easier handling and a more rapid progress, besides, what is economically most important, the substitution of single-hand drills and small holes. Even rifle powder is now used in this way, it is said, with good results. The most judicious authorities appear to agree, however, that the nature of the rock to be removed is an important element in the problem, and that the system which answers well in one mine is not necessarily the best in all. For quarries in which stones of certain shape and size are to be obtained, and for such coal mines as employ blasting, of course the shattering effects of charges are specially undesirable; and either small charges or slow-burning explosives must be preferred. The amount of ordinary blasting powder required to remove a cubic yard of rock in mining is exceedingly variable, depending upon the nature, structure, and tension of the rock, as well as the quality of the powder and the skill of the workman. FIG. 2. - Rodman's Internal Gunpowder Gauge. a a, cylindrical steel box; b b. cover; c, steel piston rod; d. steel disk, carrying e, the indenting knife. f, disk of soft copper; g, copper cup for gas check; h h, copper washer. - The smaller figures show the parts c, d. e, and f, enlarged, and viewed from the side, and the indentation made on the copper disk.